1. 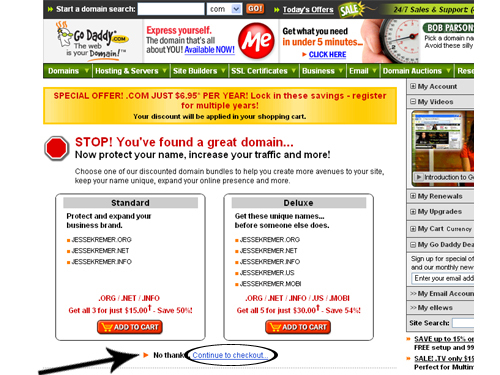 Click the link above to open the GoDaddy home page. 2. In the middle of the page their is a search box. 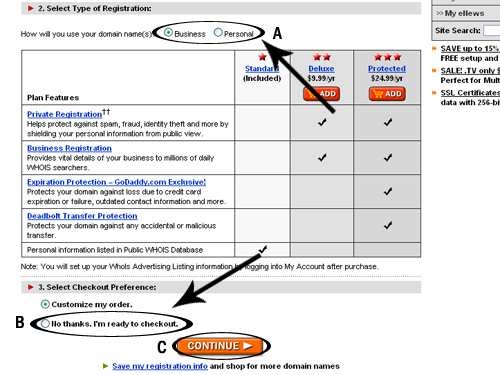 Enter the domain name that you wish to check availability for. 3. 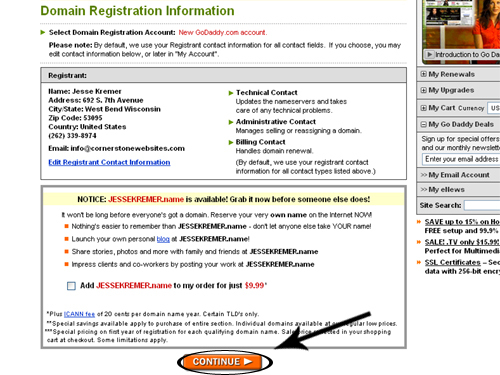 You may notice that the domain name is not available. If it is not, there are usually some other options listed on the page. You may also try using a different suffix (i.e. .com, .net, .info, .org). 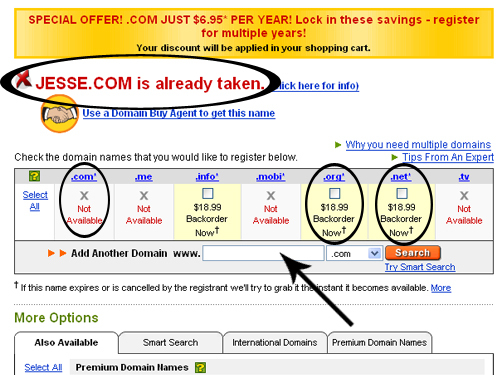 Domain names for organizations can typically use any of these, however, individuals and businesses are better served with .com or .net. 4. Try searching again in the search box. 1. 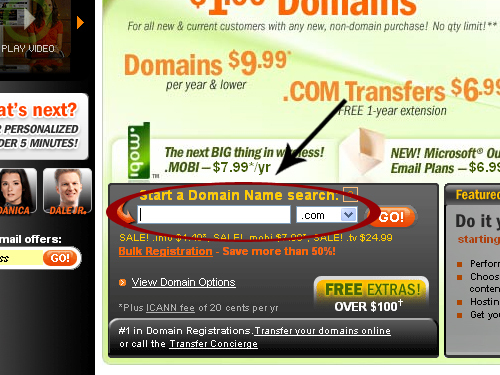 This is what will appear when your domain name is available. NOTE: During the next several steps GoDaddy has numerous sales pitches to get the customer to purchase more than necessary. 2. 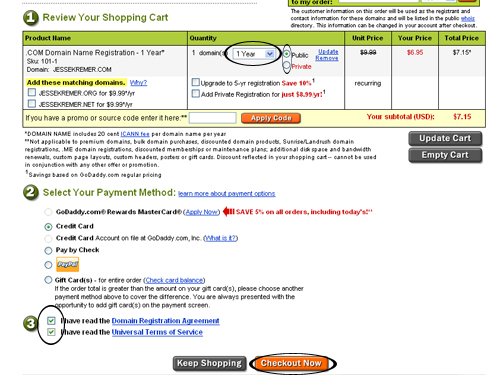 Scroll down to the bottom of the page and click "Proceed to Checkout. 3. 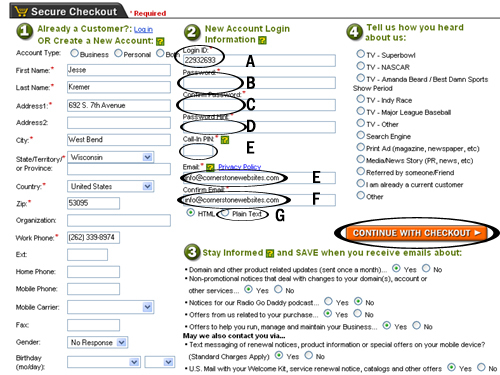 Scroll to the bottom of the page again and click the text: "Continue to Checkout". 4. Enter all appropriate information that is marked with a red star. Click "Continue" when finished. 5. Double check the information in bold and click "Continue". 6. Change the registration length to "1 Year" in the dropdown box. (NOTE: There is usually no monetary benefit to purchasing a longer registration period. Registrations will auto-renew). B. Check the "No thanks, I'm ready to checkout." radio button. 8. Double check the registration length. There is no real necessity to purchase the "Private" registration coverage. Make sure that the total cost is around $12.00 or less. 9. Select your payment method. 10. Check the two boxes related to legal issues. 11. Click the "Checkout Now" button. B. Enter a unique password. Record this. D. Enter a password hint. Record this. 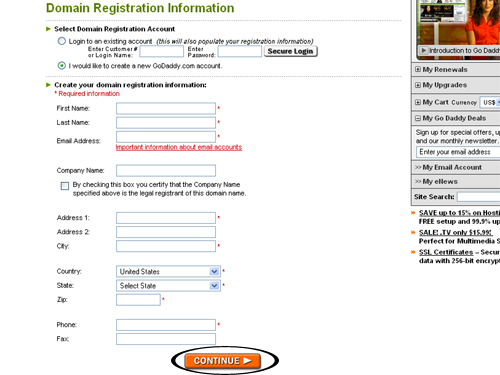 E. Enter a four-digit pin that will be used if we need to call GoDaddy about your account information. F. Enter your e-mail address twice. G. It is recommended to select the plain-text radio button. This will help ensure that the e-mails will not be "spammed out". 13. Click the "Continue with Checkout" button. 14. 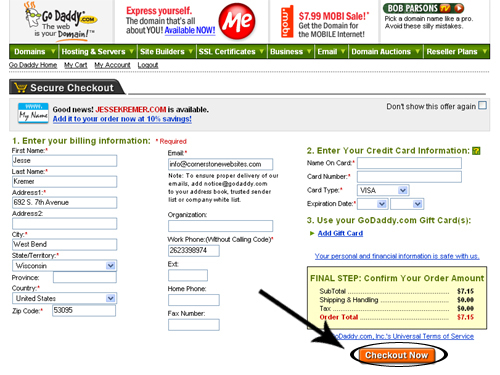 Enter your payment information and click the "Checkout Now" button. Finally!